The Grand Hôtel La Cloche has been as an iconic symbol in the center of Dijon for the better part of seven centuries. While the earliest known records of the building date to the 1400s, it did not become a hotel until at least the 1790s. The present iteration of the hotel came about during the 19th century, however, when its ambitious owner, Edmond Goisset, overhauled both its outward appearance and inner layout. Enterprising hoteliers managed to resurrect the building in the 1980s. Sofitel now operates this magnificent historical structure as the Grand Hôtel La Cloche Dijon MGallery by Sofitel. The Grand Hôtel La Cloche offers nothing less than the most luxurious experience while traveling abroad through Dijon. It possesses 88 magnificent guestrooms and suites that are perfect for resting both the mind and body. Every space featured within this wonderfully renovated hotel offers coziness, historical authenticity, and elegant charm. Sofitel has provided two fantastic dining establishments at the Grand Hôtel La Cloche as well, which will completely please the palate of every patron. The Spa by La Cloche also features an impressive array of facilities that include three elegant treatment rooms, a cozy sauna, and a peaceful Hammam. And each one of the hotel’s six grand conference halls exude a quaint, sophisticated ambiance well-suited for hosting any professional event. Nestled at the foot of the graceful Côte d’Or hills, Dijon has been one of France’s preeminent cities for centuries. Dijon was even the home of ancient royalty, as the Dukes of Burgundy used the city as their capital for close to five hundred years. Due to its prestigious past, UNESCO has designated Dijon’s historical city center as a World Heritage Site. Come begin a memorable exploration into this timeless French treasure from the steps of the Grand Hôtel La Cloche! 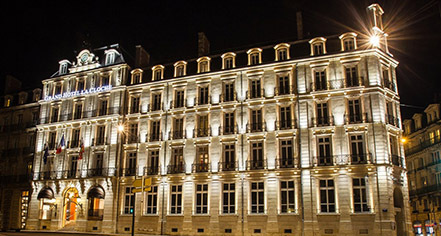 Grand Hôtel La Cloche Dijon - MGallery by Sofitel, a member of Historic Hotels Worldwide since 2018, dates back to 1884. Famed Russian novelists Leo Tolstoy and Ivan Turgenev both visited the hotel. Hotel/Resort Fees & Taxes: There is a $1.5 EUR tax per person, per night. This does not apply to persons under 13 years of age. Pet Policy: Pets up to 22lbs/10kg are allowed for an extra charge of $25.00 EUR per pet, per day. Restrictions apply. The Grand Hôtel La Cloche has been as an iconic symbol in the center of Dijon for the better part of seven centuries. While the earliest known records of the building date to the 1400s, it did not become a hotel until at least the 1790s. 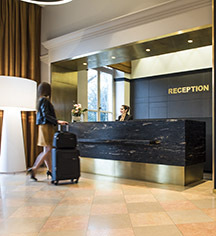 Learn more about the History of Grand Hôtel La Cloche Dijon - MGallery by Sofitel .